Three outs away from a perfect game, Domenic Mazza was feeling good in the dugout as Class A Augusta's offense batted Tuesday. "But as soon as we got two outs, I started to feel it a little bit and get nervous," he said. Stepping on the mound in the bottom of the ninth inning, the nerves didn't ease up for the San Francisco left-handed prospect. But just like in the first eight innings, he didn't have to be up there for long. Flyout to right, flyout to center. After three pitches in the frame, he faced his 27th batter of the game. Ricky Aracena took the first pitch, but couldn't resist the second. He lofted a high popup to shallow left-center field. Mazza's nerves quickly turned to excitement and GreenJackets pitching coach Clay Rapada crept toward the dugout steps as center fielder Ashford Fulmer waited below the historic ball. Fulmer made the catch in his left hand and fist-pumped with his right as the GreenJackets flew toward Mazza. He had completed the first nine-inning perfect game in South Atlantic League history. "It was just pure joy and happiness with my teammates," Mazza said with a jovial laugh. The 22-year-old struck out nine in Augusta's 9-0 win over Lexington at Whitaker Bank Ballpark. It marked the Minor Leagues' second perfect game in less than a week following Pensacola's Tyler Mahle's historic effort Saturday. In the fifth, Rapada began to see what was taking shape. Mazza struck out five in a row, then got Meibrys Viloria to fly out to cap the frame. "I was able to sit back and see things unfold. He was extremely efficient, attacked the hitters, mixed speeds and it just all came together," the coach said. "I could see he had a good slider going and a changeup, so he had out pitches for both lefties and righties. So I just kept emphasizing on one pitch at a time." Mazza (1-2) needed just 85 pitches for his first career complete game, throwing 60 for strikes. Rapada's message for most of the game was "execute," but in the ninth, it was just "trust it." "The Lexington hitters were aggressive, which I liked, just because it helped me pound the zone more and get quick outs, which allowed me to work deep into the game," the southpaw said. "My slider was better than it has been and I was just able to mix speeds and keep them off balance." The only thing that halted Mazza's momentum was a bases-clearing brawl in the top of the eighth after Kelvin Beltre homered. The slugger exchanged words with Legends catcher Nick Dini, leading to the pair being ejected, along with Frandy De La Rosa -- who was on deck at the time. Rapada felt the game and the bid were disrespected, telling his pitcher he could throw in the bullpen if he wanted to during the lengthy delay. But the 6-foot-1 hurler wasn't worried about his half of the innings. "It wasn't too big of a deal. It was just frustrating that it happened," he said. "But overall, I was fine and it didn't affect me. I just wanted all my teammates to be OK."
And in fact, the wait didn't affect him. Mazza needed just six pitches to complete the home half of the eighth, highlighted with defensive gems by right fielder Sandro Fabian and third baseman Kevin Rivera. "I gave up a line drive to right field, and off the bat, I thought it was a single and my opportunity was over with, but [Fabian] made a great diving play. I took my hat off to him and that was unbelievable," the UC Santa Barbara product said. "Then he made another one [in the ninth], running back towards the wall and made a great snag there too." It was the second perfect game in the South Atlantic League and the first since Salisbury's John Purdin tossed a seven-inning masterpiece against Lexington on Aug. 8, 1964. 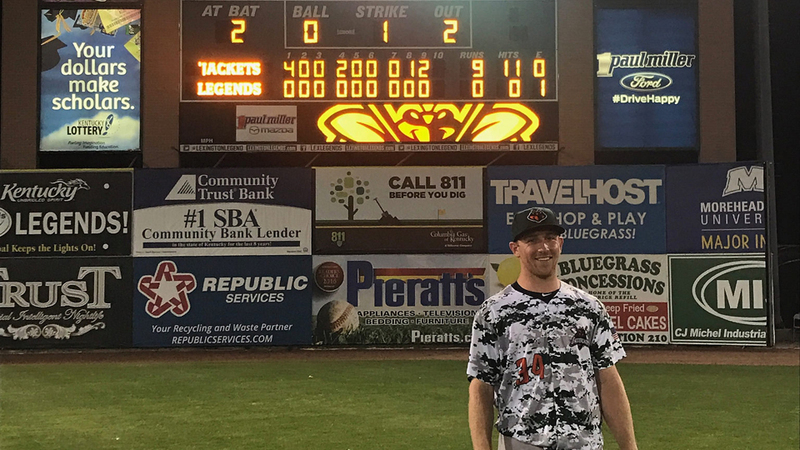 Jake McCasland held Delmarva hitless for seven frames in the most recent GreenJackets' no-hitter last July 17. In high school, Mazza drew national attention when he came in second place in an international golf long drive competition. The California native turned town the prize money to keep his amateur status and further his baseball career. Mazza returned to the spotlight and entered history books earlier this season. In his debut on April 6 against Columbia, the southpaw allowed football player-turned Mets farmhand Tim Tebow's first career home run. "The first ['milestone'] was more of a negative for myself," he said with a laugh. "But this one's definitely a lot sweeter."